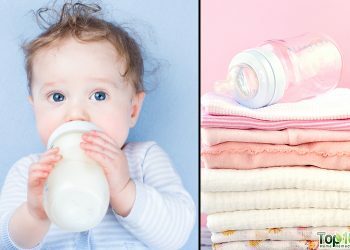 For millions of people, each change of season brings with it different types of allergy triggers and irritants. Spring gives rise to airborne pollens that drive many allergy sufferers crazy, while summer smog sets off another round of allergy acceleration. Similarly, autumn’s falling leaves followed by dust trapped in closed-up houses through the winter aggravates allergies. Common symptoms of allergies are a runny nose, a scratchy throat, coughing, itchy eyes and skin rashes. Those who suffer from seasonal allergies would benefit from preventive measures to head off allergies before they start. 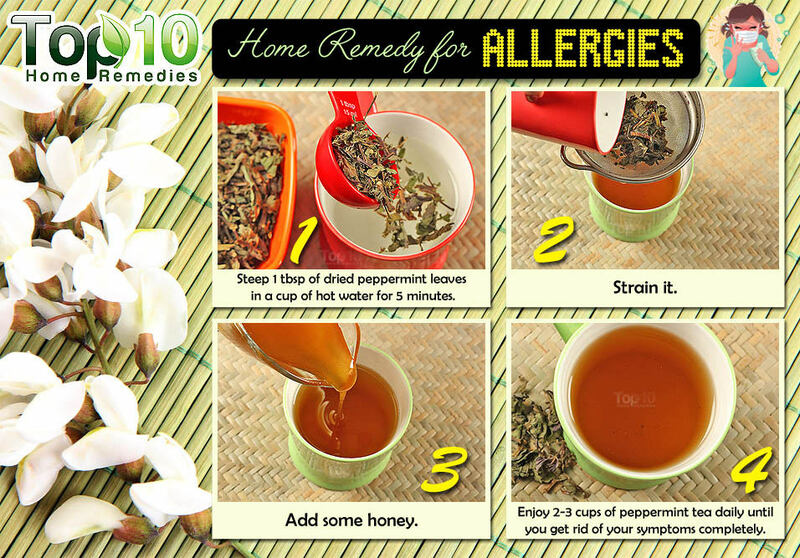 However, if allergy symptoms do appear, you can use some simple and effective home remedies to combat the problem. 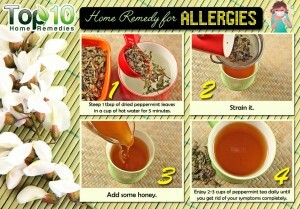 Here are the top 10 home remedies for allergies. Upper-respiratory allergies are the most common form of allergies. To help alleviate this condition, you can wash away allergens and irritants by irrigating the nose with saline solution. An independent 2008 study found that regular nasal saline irrigation helps improve symptoms of allergic rhinitis. Mix one teaspoon of non-iodized salt and a pinch of baking soda in one quart of distilled or previously boiled water. Allow the solution to cool. Bend over a sink and use a dropper to put about 10 drops of this homemade solution into one nostril. Allow it to drain back out through the other nostril or through the mouth. Do this once or twice a day for as long as symptoms last. 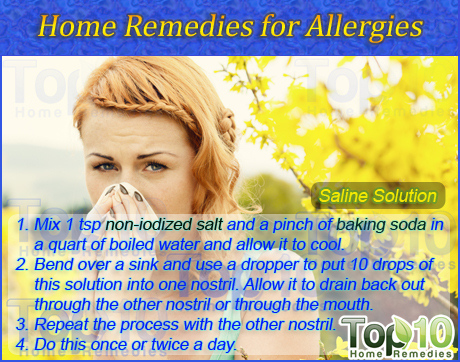 Instead of making your own saline solution, you can buy it and follow steps 2 through 5. The essential oil present in peppermint acts as a decongestant and eases allergy symptoms. Peppermint also has compounds with anti-inflammatory, antioxidant and mild antibacterial properties that inhibit allergic reactions. To make peppermint tea, steep one tablespoon of dried peppermint leaves in one cup of boiling water for five minutes. Then strain it and allow it to cool. Add one teaspoon of honey before drinking it. You can enjoy two to three cups of peppermint tea daily until you get rid of your symptoms completely. Alternatively, you can hold your face over a hot cup of peppermint tea for five to 10 minutes. This will help break up mucus and clear it out of your nose and throat. Try this whenever you have difficulty breathing. 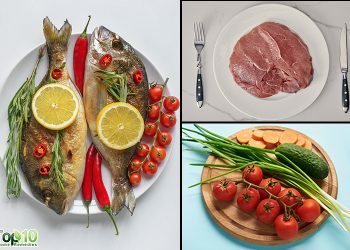 Steam can give relief from various symptoms of allergies. It will refresh and soothe irritated sinuses, while also cleaning the nasal passages of excess mucus and any irritants. Boil several cups of water until it produces a good amount of steam. Pour the boiling water into a big bowl. Add three or four drops of eucalyptus essential oil, peppermint essentialoil, rosemary essential oil or tea tree essential oil. Drape a towel over your head and lean carefully over the bowl. Inhale the steam deeply for five to 10 minutes. Repeat one to three times a day until you recover completely. Note: Keep your face far enough away from the steam to avoid burns. Apple cider vinegar is an age-old remedy for allergies. Due to its antibiotic and antihistamine properties, apple cider vinegar is very effective in treating allergic reactions. It can treat the cause of the allergy and thereby decrease or eliminate symptoms like frequent sneezing, nasal congestion, itching, headache and cough. Add one tablespoon of organic, unfiltered apple cider vinegar to a glass of water. Mix in one tablespoon of freshly squeezed lemon juice and one-half tablespoon of raw honey. Drink this three times a day until you get relief from acute allergy symptoms. Nettle leaf can be highly effective for treating seasonal as well as chronic allergies. Being a natural antihistamine, nettle leaf can block the body’s ability to produce histamine and hence give relief from various allergy symptoms. Put one tablespoon of dried nettle leaf in a cup. Pour boiling water over the herb and let it steep for five minutes. 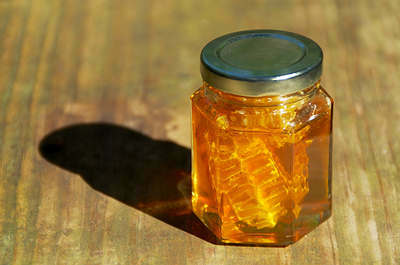 Strain, allow it to cool and then add a little honey. 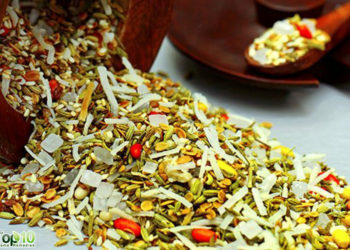 Drink this tea two or three times per day until your symptoms go away. Alternatively, you can take nettle capsules. You must consult a doctor for directions, including the appropriate dosage and how long to take it. Garlic is a natural antibiotic that can effectively ward off allergies. The antiviral and immune boosting properties of garlic can literally keep the doctor away during the allergy season. Eat two or three raw garlic cloves daily for a week or two to combat various allergy symptoms. If you cannot bear the strong smell or taste of garlic, you can try garlic supplements but only after consulting a doctor. Lemon is a natural antihistamine and an excellent source of vitamin C and antioxidants. It also works as an antitoxin. Hence, lemon is considered a very effective home remedy for allergies. 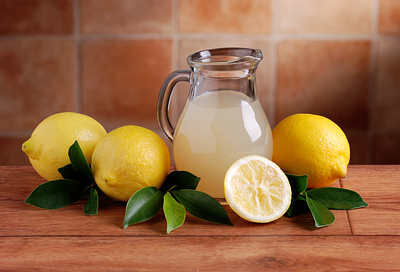 Before the onset of allergy season, start drinking a cup of warm water mixed with freshly squeezed juice from one lemon first thing every morning. Continue daily for as long as the allergy season lasts. Alternatively, add one-half cup of lemon juice, one tablespoon of honey and one teaspoon of cayenne pepper to a cup of warm water. Drink this daily throughout the allergy season to keep the body detoxified. Turmeric contains curcumin that acts as a decongestant and hence helps reduce allergy symptoms. 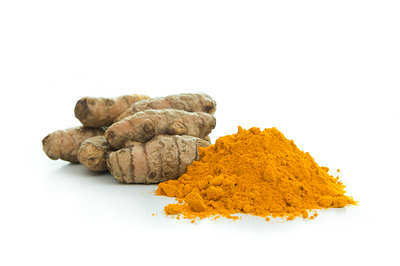 Also, turmeric is a powerful antioxidant and anti-inflammatory substance. In a clean glass jar, put six tablespoons each of turmeric powder and raw honey. Stir the ingredients thoroughly. Eat one teaspoon of this mixture twice daily during the allergy season. Alternatively, use turmeric in your cooking and you can take turmeric supplements but only after consulting a doctor. Many people swear that eating local honey really works to get rid of allergy symptoms. Local honey produced by bees in your region contains bee pollen, which helps ward off allergies. Consume one teaspoon or more of raw, unprocessed local honey three or four times a day to help relieve symptoms during the allergy season. For best results, many suggest starting to eat local honey about one month before the onset of allergy season. Enjoying a hot shower is another very useful remedy for allergies. When you spend long hours outdoors during the pollen season, your hair and skin are exposed to dust particles, pollen and other irritants that can trigger allergies. 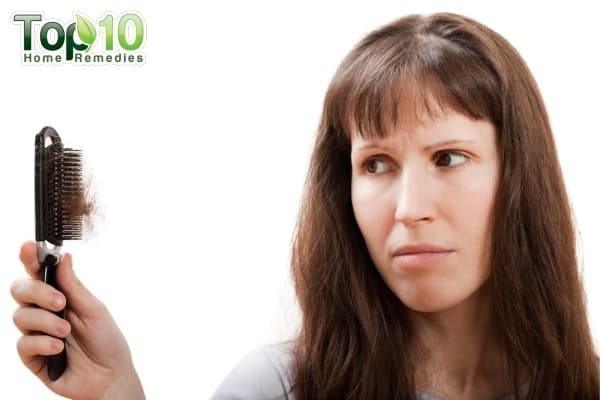 To get rid of the source of your allergy, take a hot shower and wash your hair thoroughly after you have been outside. Also, taking a hot shower helps open up your sinuses, making breathing a little easier. 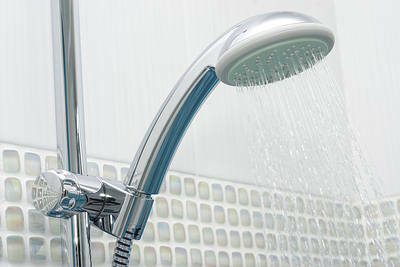 The warm water even helps you relax and enjoy sound sleep. These are some drug-free ways to treat symptoms of allergies when they arise. However, if the symptoms become severe, consult a doctor. Many many thanx for sharing information about the treatment of seasonal elergy. Please, carry on this beneficial work. 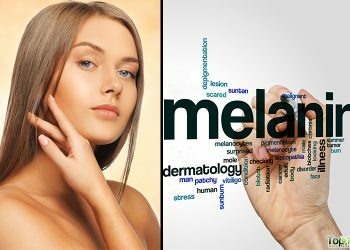 Thanks for sharing such useful home remedies.Its very easy way to get rid from such painful allergies/diseases without any side effect.